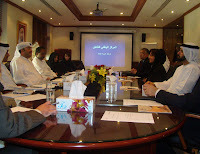 Dubai, May 2, 2009: A delegation from the Community Development Authority (CDA) in Dubai headed by Director General Dr Maryam Matar, visited Abu Dhabi National Rehabilitation Center (NRC). The visit was aimed at strengthening joint relations and communication channels on social issues related to drug abuse and addiction. Dr. Hamad Abdallah Al Ghaferi, Director General, NRC, received the visiting delegation. “Addiction is a global issue that all societies face and we must combat it by integrating efforts in the fields of legislation, health, society, security and media. We must also exchange expertise in the fields locally, regionally and internationally,” said Dr Maryam Matar. “Youngsters are mostly the victims of addiction. Although the number of addicts in Dubai is relatively low, the consequences of addiction on individuals, families and societies could be catastrophic. Early intervention to combat addiction will reflect positively on society and also contribute to strengthen socio-economic growth,” added Dr Matar. “NRC’s strategy includes a package of programmes for psychological and social support for the patients and their families. We seek to build a major database to serve as a source for specialised studies and research in the field of treatment, rehabilitation, nursing, social and psychological counselling, preventive therapy and education,” added Dr Al Ghaferi. The percentage of drug users worldwide is 5%, according to the UN world report on addiction in 2007. Alcohol is not included in the statistics. Drug alcohol intervention is a necessary step towards drug addiction recovery of family members who have fallen prey to harmful and illicit substances.